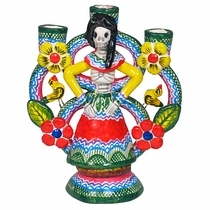 Our Mexican folk art candle holders shine as objects d' art even during the day. 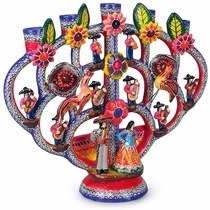 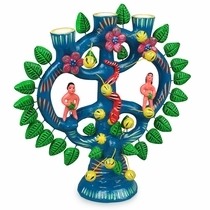 The colorful tree of life candle holders and mariachi candle holders display the impressive folk art traditions of Mexico. 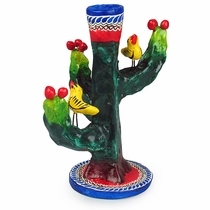 All of our painted clay candle holders are hand made by Mexico's talented folk artists. 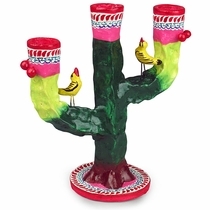 We use extra care to pack these one-of-a-kind candle holders to arrive safely. 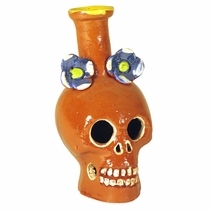 Expect variations in color pallet and size on these one-of-a-kind folk art candle holders.